I knew I was in deep when my guy was having a really bad day, and I found myself Googling bacon-wrapped meat recipes so I could cook him a yummy dinner to help cheer him up. See, I’m a vegetarian, and while, yes, I’m fine with people eating meat in front of me at restaurants, and yes, I can kiss my guy right after he’s noshed a slice of pepperoni pizza, this whole cooking meat thing had been something I avoided. Passionately. But finding Mr. Right changes things, I guess. So I found this recipe on the Food Network site (Paula Deen! Which means very fattening and very delicious – perfect!) and made a meal for my guy (and his buddy) that they moaned and groaned over and shortly thereafter renamed, simply, “Love.” My guy’s day was made better, and I’d found a keeper recipe. First of all – while having something you made renamed “Love” is quite the compliment, it can lead to some complications if you’re not careful when referencing it. So when you say to your guys’ buddy, for instance, “You’re staying for dinner, right? I’m making LOVE!” be prepared to do a little backtracking. I’m just saying. Here’s the recipe. It’s basically Paula Deen’s recipe, but main-dish style, and with a little extra kick. Heat the oven to 350 degrees. Spray a broiler pan with non-stick cooking spray. Mix up the brown sugar, chili powder, and cayenne pepper, and pour onto a plate. Cut the bacon slices in half. Wrap a half slice of bacon around each piece of chicken, pulling it kind of tight. 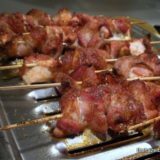 Thread the bacon-wrapped chicken onto a skewer, making sure to poke each end of the bacon so it stays on. 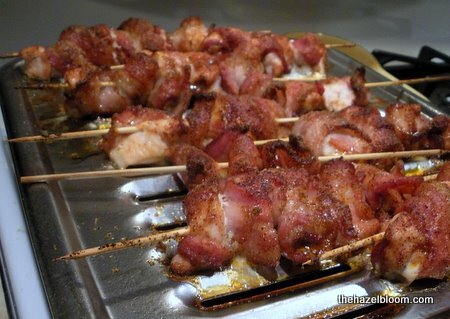 Place three pieces of bacon-wrapped chicken on each skewer. Baked for 30-35 minutes, until the bacon is crisp and there's NO pink inside of the chicken (internal temperature should reach 163 degrees). Allow skewers to rest for 5 minutes before serving.